Tap Tap Revenge 3 is back! This cool little app let’s you Tap and shake to the beat of popular music tracks. This release is all new, featuring a host of FREE songs. Hits by Tiesto and Fall out boy are included! Other hits by super star artists like Smashing Pumpkins, Korn and the Foo Fighters are also available for purchase and are reasonable in price. 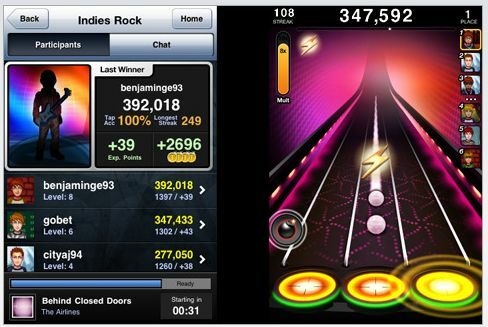 Tap Tap Revenge 3 is a lot more fun to play when you engage other people online. Playing online offers additional features and an assortment of weapons and shields that let you destroy your competition, or just plain distract them from their game. Integrated chat, enhanced rich media profiles and avatars round out the online experience. One of the best features is the ability to send messages to those that you meet online, which makes the game more social. Social gaming is the best gaming, after all. In this Tap Tap Revenge 3 iPhone Game, you can create your own unique avatar, which displays to the other players. The objective is to advance levels and unlock achievements so that you gain access to additional avatar items, which includes musical instruments with special powers for advanced online play. 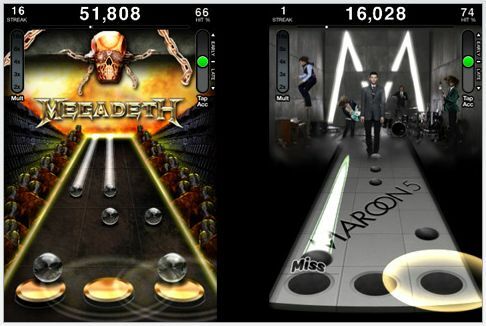 Other groovy new features in this tap tap revenge ipod touch game include Quick Play, for times when you need a quick fix, and special sequences for higher scoring. You can also pause, resume, restart and replay. Challenge and battle with your friends and send messages, too! In addition, each premium track comes with its own uniquely designed theme. Even the Free tracks that are included with the app are really cool. Check out Stroke 9, AFI, Fall Out Boy, Tiesto, LMFAO and many more! You could get this iPod Touch game and read all great reviews here.